Our most recent road trip lasted 12 days where we drove from South Florida through Alabama, Kentucky, Ohio and then Tennessee & Georgia on our way home. When trying to pick out favorite moments from our trip I’d be hard pressed to say that my visit to Boyce General Store was my favorite stop but it definitely was. I had been in contact with them through Instagram and they seemed pleasant but the truth is I was wrong, they were way beyond that. My wife Marcela, my bud John and I arrived starved to Boyce General Store a good 30 minutes before closing time. Our car was running on fumes but it was more important that we make it here. We could worry about that gas situation later. Boyce General Store opened back in 1869 but it wasn’t until Brad and Brie Golliher purchased it in 2012 that it became a full-fledged restaurant. It also allowed Brie to show off her killer baking skills as The Pie Queen. *There’s one person in front of us while we wait to order which is always a good thing when you’re a first timer. John spots the Specials board and smiles over at me. There’s a Pimento Bacon Cheese Burger on there, done deal. 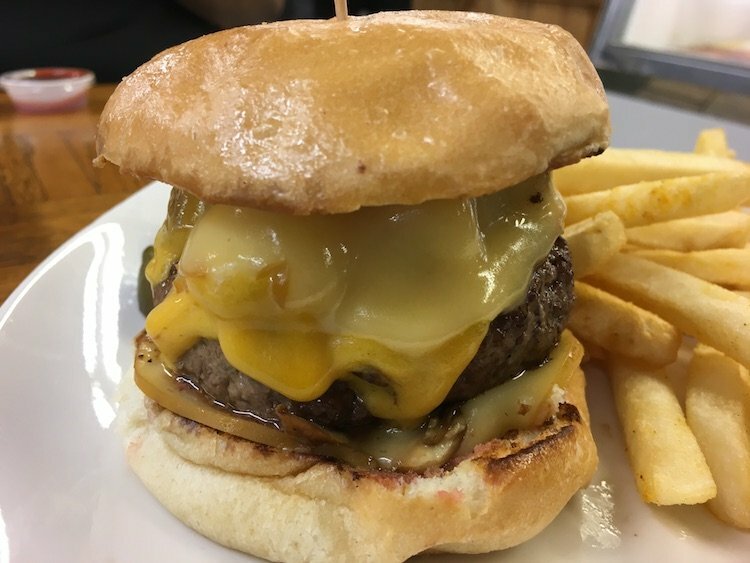 The Burger itself is one-third of a pound, hand pattied and made from locally sourced beef. We’re off to what sounds like an amazing start in a Burger Fairy Tale book. It’s then topped with properly cooked Bacon (just look at it) and a slab of their housemade Pimento Cheese (one of the loves in my life). I was in heaven. It was after eating that we got into a conversation with Brad and Brie. They talked me into…..well….maybe more like they sold me on why I needed to try the BBQ Ham Cold Cut Sandwich. I was full at this point but this excellent dude made a great travel companion on our way to Lexington…he unfortunately never made it to the destination. Afterward, we had an awesome conversation about Boyce, its history, her baking, and my Burger Museum. They then donated a couple of old Cola bottles from a local bottling plant that is unfortunately no longer around and a book about Kentucky Eats in which they were mentioned. What I really wasn’t expecting was that they also wanted to add a 40-year-old Coca Cola sign (that hung outside Boyce General Store once upon a time) to the Museum’s collection. I’m still blown away by the kindness and generosity when I think about it now. I can’t wait to visit Boyce General Store again for some real Southern Hospitality and of course excellent food cooked with love. See you soon my friends, I promise. *Most of our pictures were lost from our visit to Boyce General Store so John’s and Marcela’s food, as well as our desserts, are not shown.